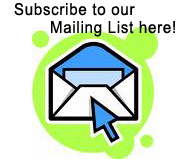 ACTION 2 – Another success! 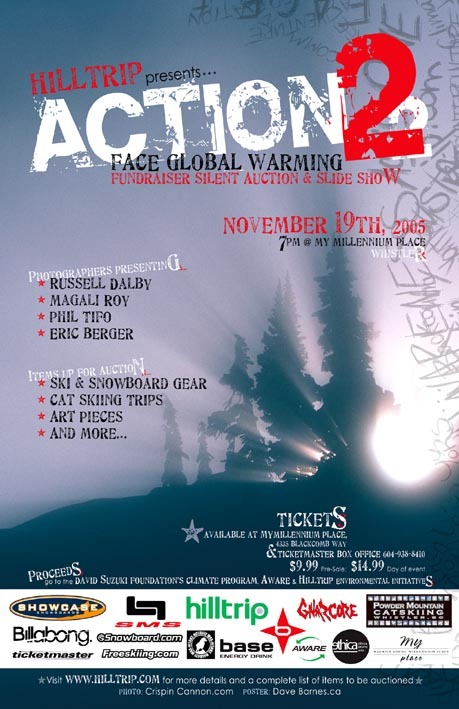 Saturday evening, November 19th, HillTrip presented Action2 – its second fundraiser silent auction & slide show event to fight global warming. Through the Silent Auction, Showcase Raffle, BASE fundraising drinks and ticket sales, Hilltrip raised $2,275. The funds will be equally donated to the David Suzuki Foundation Climate Program, Hilltrip for its environmental initiatives and A.W.A.R.E, the Association of Whistler Area Residents for the Environment, to aid each organizations fight global warming. Overall, this all ages event was a huge success. I’m very happy at how Action2 turned out. Everybody who came learned something about global warming and that was one of our main goals. In the lobby guests were introduced to AWARE, the One-Tonne Challenge and Hillbilly & Enviro-Ethica Wax; and were invited to join the AWARE environmental group, participate in the One-Tonne Challenge as well as buy environmentally friendly wax. Moving from this environmental immersion, attendees could learn more about climate change in our mountains by reading each of the 5 Melting Mountains panels that were placed in the stairway to the main floor where the silent auction was located. From 7 to 9pm the silent auction and Showcase raffle took place. Most guests participated and won items at a great price. The Sapient Snowboard from Showcase was the highlight of the raffle. There was 80 items up for auction, including 25 art pieces where starting bids ranged from $10 for print to $600 for originals. Other auction items ranged from beauty products, ski and snowboard gear, Ziptreck tours to catskiing trips, and starting bids ranged from $10 to $300. As part of the Catskiing packages, the equivalent of 2,000kg of CO2 in carbon offset is provided by Hilltrip, witch makes the catskiing trips auctioned carbon neutrals. Following the silent auction was the highly anticipated slide-show featuring majestic and timeless photo’s of our environment and lifestyle as seen through the eyes of Eric Berger, Russel Dalby, Magalie Roy and Phil Tifo. During a brief intermission the audience was wowed by a moving speech from Tyler Bradley, environmental chemist and co-owner of Hillbilly Wax-Works & Ethica Enviro-Wax brands. Tyler informed the crowd about new developments in snowmobile technologies and about the impact of environmental toxins, specifically the perfluorochemical family and things such as Teflon. In the end, the eclectic blend of photo, music, information and passion brought to light many of the things we, as a mountain community, need to be thinking about everyday in order to make informed decisions which will help to preserve this wonderful place for generations to come. An article published a week ago by GreenBiz.com mentioned that studies in the states forecasting that ski resorts in the Rocky Mountains will be all shut down by 2050 if global warming continues at its current rate. A big thank you to everyone who came to Action2. A lot of people volunteered their time to make this event happen and it’s great to see that so many people came to support the cause. I would like to thank Danielle Poirier for her incredible work on the merchandising of the silent auction. Global warming is such an important issue, it’s important that we realise the urgency of the situation and start acting now.